With a dab of paint I become the singing, dancing doll everyone loves. The stories told with Southeast Asia’s shadow puppets, better known in the region as ‘Wayang Kulit’, range from adaptations of ancient epics to familiar, domestic sagas. This poem was written in 1977, when the Malayan-born Wong Yoon Wah (by then an outspoken scholar, critic, and award-winning writer) was appointed Director of the Institute of Humanities and Social Sciences at Nanyang University—just as higher education in Singapore was experiencing a period of upheaval. In this poem, Wong holds his own multiple identities up to the light, and a candid sense of his inner self shines through. pares the leather into shape. carves each nub of my character. The village’s earth is a white gauze. In this soiled world, I can’t find myself. but never with my own voice. At home, I’m a shadow on the screen. On stage: a self you can see. A shapeless thread holds each of my four limbs. Being superstitious, I can’t refuse being fate’s plaything. has my voice in his hands. in the arms of the ugly puppeteer. we’ll wait to see the sun. Born in Malaysia, Professor Wong Yoon Wah has won Singapore’s Cultural Medallion (1986), Thailand’s South-East Asia Write Award (1984), and the ASEAN Cultural Award (1993). He has published more than twenty books as well as over fifty articles on modern and postcolonial Chinese literature, and is presently Senior Vice President of Southern University College, Malaysia. Theophilus Kwek has published three collections of poetry, most recently Giving Ground (2016). 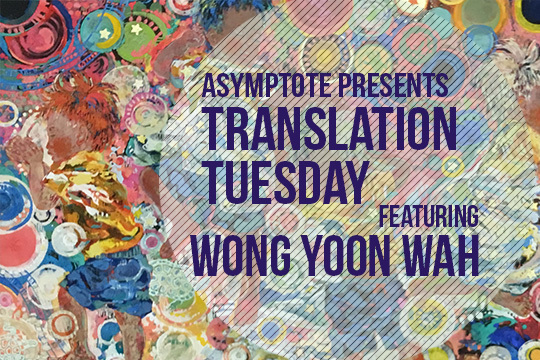 He won the Jane Martin Prize in 2015 and the New Poets’ Prize in 2016, and his translation of ‘Moving House’ by Wong Yoon Wah placed second in this year’s Stephen Spender Prize for Poetry in Translation.